Beadweaving is a form of jewelry making that ranges from kid-friendly to insanely complicated. It can be both beautiful and exotic, simple and complex. There are lots of different types of beadweaving. Before we discuss that, here's what it's not. If you pass the thread or cord through a bead only once, I call that bead stringing. 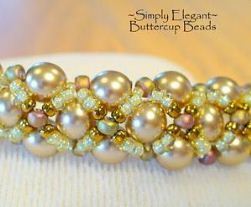 You can learn more about beadstringing, and see lots of free projects on the Stringing Beads page. I classify "beadweaving" as anything that requires cord or thread to be passed through beads more than once. I don't have a lot of patience for those tiny beads and picking them up with tiny needles, but I have a lot of respect for the many patient and talented beadweavers who do. You can find a few project links further on in this article. At the very minimum, you need some strong thread, some beads, and a needle that can accomodate the thread, AND is small enough to pass through the beads a few times. This is especially tricky with seed beads, and there are specialty threads and specialty beads available that make the job of weaving and uniformity easier. Beginners might have less frustration if they start with bigger beads. Sometimes you can skip the needle by using monfilament thread with regular beads, or thicker nylon thread with pony beads (for kids projects). Of course, we had no idea what it was called back then. We just thought they were cool. 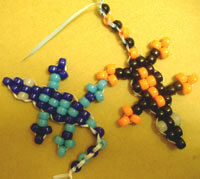 The bead lizard is fun for both kids and adults alike, and it looks adorable whether it's sitting on a shelf or hanging from a backpack zipper. Check out our how-to here. 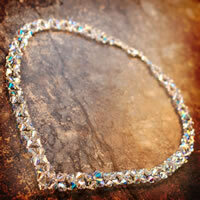 This crystal necklace by guest artist Eri Atteberi is gorgeous and goes with anything. Bead-weaving is easy when you watch Eri on video. It's fun to make and elegantly designed, a great piece for a night out! Check out Eri's how-to here.